Heat oven to 400°. 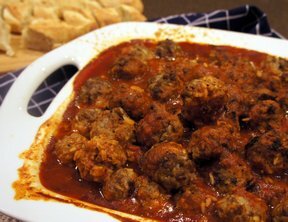 In large bowl, combine all meatball ingredients. Shape mixture into 16 meatballs, about 1-1/2 inches in diameter. 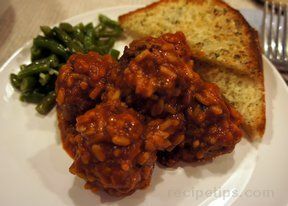 Arrange meatballs in an 8 inch square baking dish. Bake for 15 minutes. Drain. Meanwhile, combine all sauce ingredients in 1 qt. saucepan. Bring to a boil over medium-high heat. Cook for 3 to 4 minutes, or until jelly is melted, stirring constantly. Pour heated sauce over drained meatballs. Bake for 10 to 12 minutes, or until sauce is hot and bubbly. 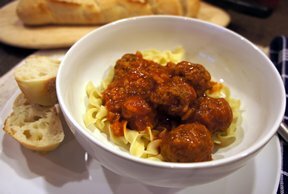 Serve meatballs over mashed potatoes or hot cooked noodles, if desired. Note: to make meatballs as an appetizer, just shape them smaller.